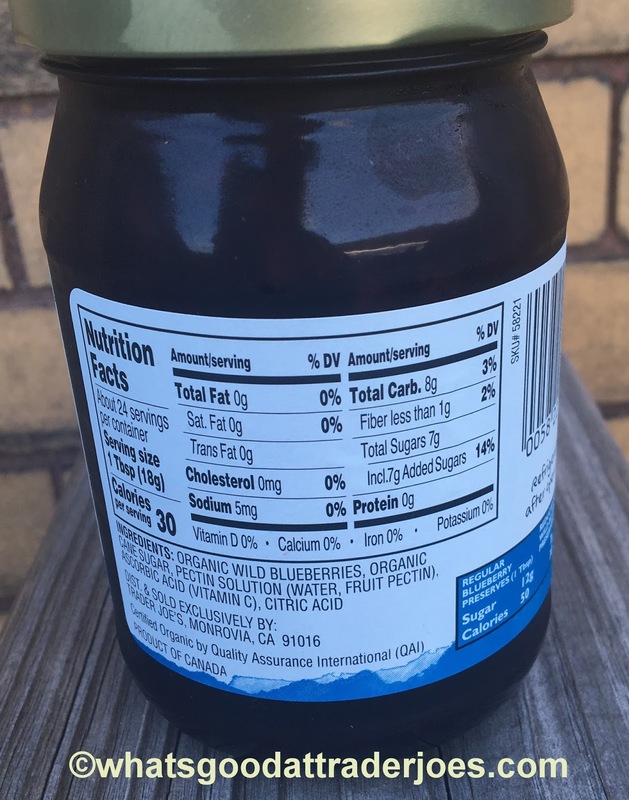 Here is the easternish part in the ol' U-S-of-A, there's two main types of blueberries, at least as far as I can discern. One I'll call the "New Jersey blueberry." Those are the huge, round ones, can be as big as marbles. No Chris Christie jokes, please.While they can be sweet, more often than not, those berries tend to be a little more bland to downright sour, and can be mushy very easily. There's not a whole lot necessarily wrong with them - as a kid in suburban Philly, we'd often cross the Delaware River and pick a few quarts for pies and whatnot - but they're not the "good ones" compared to their brethren, what I'll call the "Maine blueberry." Wild Maine blueberries are the bomb. Small, potent, often extra sweet naturally, without anything else added to them. I associate them with Maine because I can recall picking and eating them right on the spot on family vacations visiting my grandparents and traipsing around the south central part of the state. 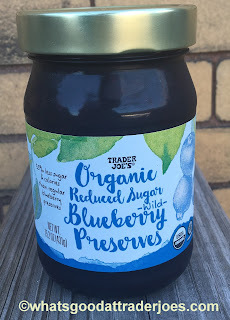 Seeing as that Trader Joe's Organic Reduced Sugar Wild Blueberry Preserves is both very sweet, with smaller looking berries in here, it seems a no-brainer that some berries akin to my preferred Maine blueberries are used. It's also a Canadian product, so probably Canadian berries, and NJ is a bit further away from Canada than Maine, so...there's that, eh? As one should expect from preserves (as opposed to jelly or jam), this is some think, chunky stuff, with the emphasis on the fruit. I swear there's whole berries in almost every bite. It's simplistic enough of a recipe for sure, almost bordering on what you Aunt May would do while canning her own. No hint of anything fake. Except...probably less sugar. 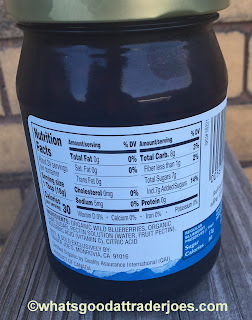 It seems odd that a concoction that is composed of 7/18ths added sugar is considered "reduced", and I think I just got a cavity thinking of how much must be in normally sugared jam. Ugh. Anyways, as I said, it's thick and chunky, and almost bordering on a high quality pie filling-type consistency. Yumz. Delicious stuff, it really is. It's enough that my daughters have asked for "yogurt with blueberry jam" for breakfast every morning for the past week - pictured is our second jar in as many weeks. Seems healthyish enough I don't mind giving it to them so often. And I'll admit to eating it straight off the spoon. Anything else you'd like to do with some good preserves - scones, toast, alongside some cheese, etc - go for it, it'll work. And all for a very reasonable price - only $2.99 for the jar! Nice! Really can't argue or find many nitpicks - I can't, Sandy can't, our kids can't. Our five year old gave it a perfect score, and I can't argue that. Tastes like summer in a jar - this might be our main jam for now on. I rarely buy jam because it's always just too crazy sweet for me. 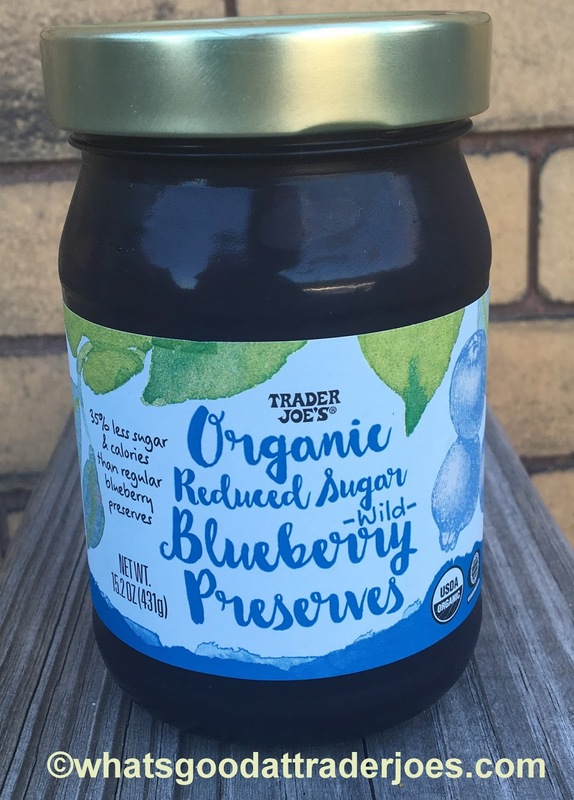 For my own breakfast yogurt i often just use some defrosted and then semi mashed fruit from TJs- and the wild blueberries are a favorite.